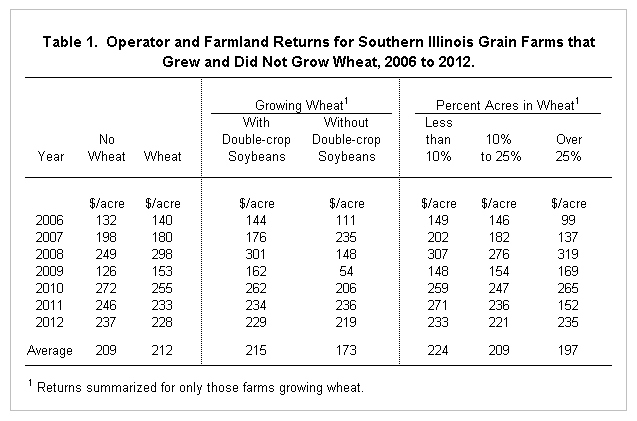 In this post, returns are compared on southern Illinois farms that grew and did not grow wheat. Specific comparisons are for farms growing and not growing wheat, farms having double-crop soybeans following wheat, and farms having different percent of their acres in wheat. These comparisons are made for years from 2006 through 2012, corresponding to the period of higher commodity prices. Overall, comparisons suggest that farms growing wheat had comparable profitability to those farms that did not grow wheat. The farm had to be located in southern Illinois. The farm had to receive the majority of its income from grain farm operations. The farm had to have records that were certified usable by FBFM field staff. Data were summarized for the years from 2006 through 2012. The year 2006 was chosen to begin the analysis, as that was the year commodity price began to rise and reach higher levels. Each year, the above screens were applied and farms meeting the screens are summarized below. Farm numbers differed across years. In 2012, there were 307 farms summarized below. Other years had roughly the same number of farms summarized. Operator and farmland returns were used to make comparisons. Operator and land returns equal gross revenue minus non-land costs. Not included are non-land costs such as property taxes and mortgage interest payments on owned farmland, cash rent on cash rented farmland, and share rent distributions on share rented farmland. Farms differ in ownership and renting structure; hence, land costs will vary across farms. Not including land costs causes ownership and tenure differences to not be reflected in the data. For farms with wheat acres, farms were divided into categories based on the percent of acres in wheat: a) less than 10% of acres in wheat, b) 10 to 25% acres in wheat, and c) over 25% acres in wheat. Table 1 shows operator and farmland returns for the above divisions. Averages for each year are reported from 2006 to 2012. Also reported are the averages for the all years. Most focus will be given to the overall average from 2006 to 2012. The average return for those farms that did not have wheat was $209 per acre compared to $212 per acre for those farms that did raise wheat. Overall, there was no statistical difference in returns from farms with and without wheat. In some years, farms with wheat had higher returns than farms that did not have wheat: 2006, 2008, and 2009. In the other years, farms with wheat had lower returns than farms without wheat: 2007, 2010, 2011, and 2012. For those farms with wheat, double-crop soybeans increased profitability in most years. Over the entire period, farms with wheat and double-crop soybeans had an average operator and farmland return of $215 per acre and those farms not growing wheat had a return of $173 per acre (see Table 1). The presence of double-crop soybeans had higher returns in every year except for one: 2007. Most farms growing wheat had double-crop soybeans. Farms without double-crop soybeans range from 8 percent in 2007 to 13 percent in 2006 and 2010. Weather and timing issues may influence whether a farm grows and does not grow double-crop soybeans. Over the entire time period, farms with over 25% of their acres in wheat had lower average return compared to those farms with less than 10% of their acres in wheat: $197 per acre for farms with over 25% of their acres in wheat compared to $224 for less than 10% in wheat, a difference of $27 per acre. In four years, farms with over 25% of their wheat had higher returns than farms with less 10% of their acres: 2008, 2009, 2010, and 2012. In the remaining years, the over 25% had much lower returns than the under 10% group. In 2011, for example, farms with over 25% acres in what had a $152 per acre return, $119 lower than the $271 per acre return for less than 10% of the acres. A number of reasons revolving around weather and timing could be given for these differences in those select years. Future evaluations of these factors may prove beneficial. Overall, those farms with wheat had roughly the same operator and farmland returns as those farms without wheat. Having double-crop soybeans increased profitability on farms growing wheat in most years. Percent acres in wheat had impacts on returns. Overall, farms with less than 10% of their acres in wheat had higher returns than those farms with wheat over 25% of their acres in wheat. Overall, these comparisons suggest that wheat remained a viable crop in southern Illinois farms over the 2006 through 2012 time frame.